Esri have stated that enabling custom widgets within the embedded version of Web App Builder in Portal for ArcGIS is currently NOT a supported workflow. We want to be able to update the pallet of widgets that all Portal users have available to them when authoring web apps within Web App builder in such a way that they do not need to download templates, customise and then re-host their web application separately on their web server in order to support custom widgets. 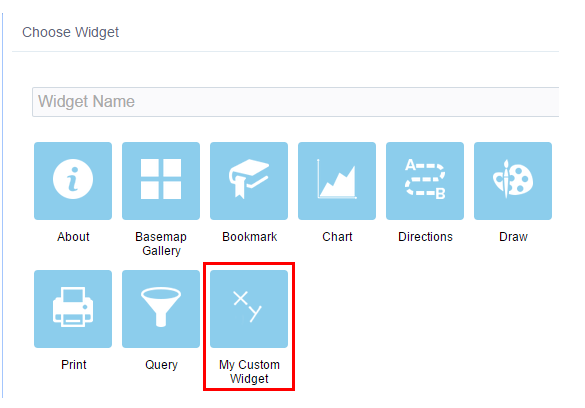 We want users to be able to choose our custom widgets directly from the Widget pallet when they begin authoring web apps and not be constrained to using only 'generic' widgets that Esri has decided to provide at each update to Portal for ArcGIS. We believe there are portal users out there who want to build custom web apps with web app builder but are not skilled enough to develop locally and then re-host their applications on a web server. These users would benefit from being able to quickly publish new web apps that utilise custom widgets that our developers have implemented for them. We are asking for this or a similar workflow to be supported. I have some good news for you: at the Portal for ArcGIS 10.5.1 release (scheduled for release around UC timeframe), the embedded version of Web AppBuilder in Portal will support custom widgets. Derek, will 10.5.1 (or planned versions) also support embedding custom widgets and layouts hosted on ArcGIS Online and if so would credits be charged? Supporting custom widgets for Web AppBuilder embedded in ArcGIS Online is under consideration, but there are no definitive plans at this time.